**This post contains affiliate links. If you make a purchase I may be paid a small commission. Did you know that women with ADHD can be, and often are, perfectionists!? I’ve done a startling amount of research on ADHD in women and I have become particularly interested in how we can better manage our emotions. This started out as a review of Dr. Jane Bluestein’s book, The Perfection Deception. I had a chance to hear Dr. Bluestein speak at my local JCC a couple years ago. Her talk was intensely interesting to me. I have ADHD and I am a perfectionist. This is what I have learned. Buddhists celebrate a philosophy called Wabi Sabi. What the hell is wabi sabi, you ask? That’s me – naturally flawed. Practice self-acceptance by embracing your imperfections. As a person with ADHD – I take mistakes hard. I want in the worst way to do everything perfectly so that I won’t be judged for my diagnosis. In the past, my mistakes were pointed out to me and criticized fairly harshly, so now I criticize myself. In my head. As a child I told adults whatever I thought they wanted to hear. Never argued with teachers, parents, or anyone I interpreted as an authority figure. 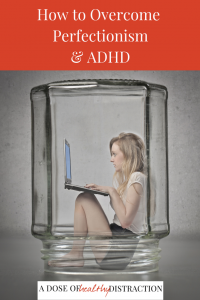 Many children with ADHD are just the opposite, they can become oppositional and argumentative. My son is an excellent example of this. He argues just for the sake of argument. I didn’t argue as a child, I just tuned everything out. Sometimes I still do. But more often than not I say “yes” when I should be saying “no.” Why? Because I am a big fat people pleaser looking for approval. And I need boundaries. Shocking! (Can you hear my sarcasm, here?) Fear of failure? Self-sabotage…fill in the blank. Procrastination takes many forms. Often we don’t even realize we are doing it until we reach a critical point and start to panic. Do you procrastinate? You might want the read this post. The older I get the more I want to understand other people. In general, I don’t like to judge or hurt anyone’s feelings. Remember that when we criticize someone else, it is usually because they have triggered some insecurity in us. If you find that you are highly critical of others it might be because of your own perfectionism and the need to deflect some of that negative energy. I’m so bad at talking about feelings. I mean epically bad. My husband could tell you stories about my inability to have difficult conversations. I love getting to know others but sharing myself is a weak spot. I actually planned my wedding with as few witnesses as possible because I didn’t want to say “I love you” in front of people. If that’s not pathological I don’t know what is. Do you have trouble opening up? If so, you might be a perfectionist in hiding. where do ADHD and perfectionism intersect? Examples of adaptive perfection exist in professional athletes and surgeons. I’m not gonna lie, if a surgeon is working on me I expect perfection. Unfortunately, perfectionism for me tends to be more maladaptive. It would stand to reason that I am not alone in this – I know other women with ADHD who appear to be perfectionists and exhibit some of the traits I discussed above. The APA article explains that when you start to believe that perfection is how you attain social acceptance – that is maladaptive behavior. For example, if you put so much pressure on yourself to develop the perfect body and you go down the path of disordered eating – that is maladaptive. I’ve been guilty of both of these maladaptive perfectionists tendencies in the past. No matter how much I learn about women and ADHD, I still suffer with this urge to force myself into being perfect. Achieving a perfect body, perfect home, and perfect credit score will make my life infinitely more satisfying. Right? I have ADHD and I am a perfectionist. Instead of focusing on perfection, which doesn’t exist, lets focus on self-improvement. Find the beauty in your own imperfections. Keep an open mind and an open heart. Know that “good enough” really is enough. The only person you need to please is yourself. Now tell me what do you think – Can you overcome perfectionism?